Flowers are important in our lives, as an inspiration and to give peace of mind. However, the life of flowers is short. They soon wilt and die. To overcome this problem, flowers can be dried or preserved in a number of ways ( Fig. 1(530)). Dried flowers used for pot-pourri. First, we shall look at the steps followed when drying flowers. The first step in preparing dried flowers is to choose suitable materials. The flowers must have esthetic value, and be picked at the right time. Early morning is the best time, but only after the dew has dried. They should not be picked in the afternoon, as they are too dry at that time. Another important criterion is that the flowers must be healthy and undamaged. Drying can be done by air drying, using a microwave, or by drying in some kind of “medium”. Coloring is done to strengthen the original color of the flower, or to modify the original color according to the required composition. Once the flower is dried, most of its original color disappears. Artificial color can be added by painting, color absorption, or by using citric acid. This is done so that the original color of the flowers fades to white. Then, when artificial color is applied, the flowers will pick up the new color faster. The decolorizer used is sodium hypochloride or sodium chlorite. The flowers are soaked in it. The flowers are treated with fungicide to avoid fungus that can cause the flowers to rot and fall. To get an attractive flower, it is advisable to color the materials using the color absorption method. Flowers which have been treated and colored are tied with a rubber band and hung upside down to dry. This is a better way, but rather expensive because of the equipment needed. The flower is hung upside-down, first at a temperature of 40oC and then at 45oC until it is thoroughly dry. It is then sprayed with clear aerosol to make it more attractive. This is the best drying method to use for roses, orchids and carnations. 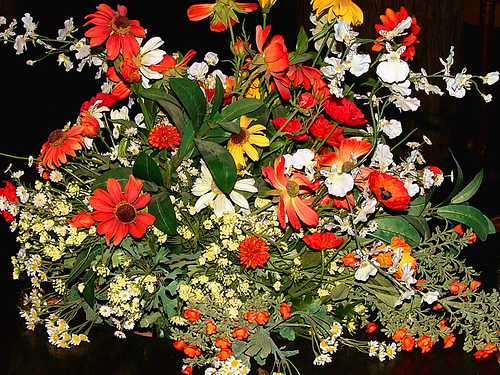 Use a medium such as silica gel to hold the flowers in place inside the microwave oven. Dry for three minutes, using medium-high heat. Use an ordinary iron to press the flowers. Pressed flowers will look as beautiful as the originals. Before pressing the flower, place it between two sheets of paper or blotting paper. Set the iron to a low heat, and press it down without moving it for a few minutes. If pressing is to be done inside a microwave oven, just put the flower between two porcelain plates. Heat it at medium high speed for about three minutes. Other methods of pressing flowers are by putting them inside the pages of a book, or by using a heavy wooden board or a commercial press. Pot-pourri is a French word, meaning “a mixture of herbs and spices”. Basically, a pot-pourri mixture consists of three components: the plant materials, stabilizer and essential oils ( Fig. 4(592)). Scented flowers such as roses or jasmine are generally used. Other parts of the plant, such as the leaves, seeds, fruits, stalks and roots, can also be used. Sometimes flowers such as button flowers are also used to add a good appearance, although these flowers do not produce any scent. A stabilizer such as orris root is used to absorb and maintain the scent in the pot-pourri. Essential oil is used to add perfume, or to give a special scent according to one’s taste. The oil is extracted from leaves, flowers or herbs. A range of oils are available in the market, including rose, jasmine and lemon. can be used, such as lemon peel and scented flowers such as roses. Spices and kitchen plants such as rosemary and basil can also be used in small quantities. First mix the stabilizer and the oil(s) together, before mixing them with the dried flowers, then mix them all thoroughly. Keep the pot-pourri inside an air-tight container which is half full or three-quarters full. Shake the container every day for the first week, and keep it about six weeks before using it. A quicker way is to mix all the materials (dried flowers) and the stabilizer together in a plastic bag. Spray with perfume, shake the bag, close it tightly and keep it for an hour. Repeat the process three or four times. The presentation varies. We can put pot-pourri into attractive containers, which we open only when we want to smell the pot-pourri. We can also put the pot-pourri in a sachet and hang it in a car or locker. If potpourri is being used for this purpose, it is better to prepare it using material such as pieces of wood or roots. These are cut into small pieces, to which perfume is added. Pot-pourri made in this way lasts for longer. The drier the materials, the better the result, and the less likely to attract fungus. There are other factors that contribute to good presentation, especially color. For example, brightly colored flowers are suitable if the pot pourri is kept in a glass jar. For the pot-pourri to last longer, it is better to close the container at night and open it only during the day. Revival Oil, which is an essential oil, can be added when the scent has faded away. Just put in a few drops, and keep the pot pourri for two weeks before using it again.